I don’t remember the last time, while eating, that I left the spoon or fork in my mouth just a little too long so that I got that metallic taste on my tongue, that odd sensation that seems to automatically negate the pleasant sensation of whatever it was you were eating and replace it with something I imagine feels similar to what you’d feel if you were to dump half a cup of salt on your tongue, then close your mouth and attempt to smile. It would be a salty smile, of course, amusing to watch but not so pleasant to make. Though I suppose there are stages in one’s life when one might actually enjoy that taste and others on the more extreme side. 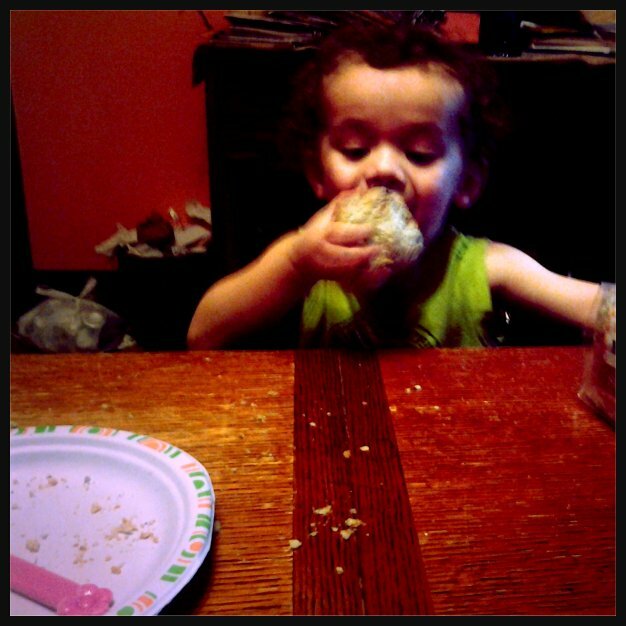 My two year old son, Julien, for instance, would, if we let him, eat butter straight from the its container, digging in with his fingers and happily shoving it into his mouth. He’s tried this a number of times, and to stop him in the middle of this act is the sort of thing that makes him incredibly unhappy. It’s at moments like these when I try to distract him with music, and the other night the song I distracted him with a song called “Point of View” by a group called DB Boulevard. I first heard this song in 2002, the year it came out, while watching television with Heather at my brother-in-law’s apartment in State College, Pennsylvania. As it was, he wasn’t in his apartment at the time–he was, rather, in the hospital, suffering from a serious flare up of a chronic intestinal condition. His hospital stay was what brought us there to visit, and it was on the way while toward State College that my brother Tony called my cell phone to say that our Dad had just had a colonoscopy during which they found some serious, blockage in his intestine, so much so that they were unable to perform a complete colonoscopy. I am, at times, astounded by the connections between the most insignificant details. In this instance, however, I was too distressed by the news to note the coincidence of my brother-in-law and my father undergoing comparable medicals issues at the same time; and the obsessive tendency of my mind to take almost any situation and imagine it through to its most horrible conclusion led me to think immediately—even though we didn’t know for sure if cancerous growths or something less serious was causing the blockage—that my father was now in the process of dying. All of which seems to show that, for me, pessimism trumps any pleasure I may get in trying to connect the dots and surmising the relationship between things, and that when given the opportunity to make a shrewd observation or dive headfirst into despair, my mind—gladly, if you will—chooses to do the latter. Much of that trip to State College, then, was spent worrying about my dad, as well as my brother-in-law. Plus, on top of that, I started worrying about the possibility—though at the time my mind considered it more a likelihood than simple possibility—that my father would never get to meet his grandchildren. That night, after getting that call on the way into town, we went to the hospital to visit Heather’s brother, then, after stopping at some dreary restaurant to eat, went to his apartment which was where we would be staying while we were there. We turned on the television, and after flipping through the stations, we settled on some station that was showing videos. That was when I saw, for the first time, the video for Kylie Minogue’s “Can’t Get You Out of My Head”—a song which I rather enjoy even though I always associate it with sickness. And it was after the Kylie Minogue song that I saw the video for the DB Boulevard song, in which we see a cardboard figure of a young woman driving about some modern city, which is also constructed with cardboard. Heather and I immediately liked the song and the video. Then, one evening, some ten years later while I was looking for something to calm Julien down from some tantrum and–wanting to try something other than the usual sure-fire calming songs, like Sade’s “Your Love Is King” and The Go-Betweens’ “Streets of Your Town”–I remembered DB Boulevard’s “Point of View.” I looked it up on YouTube, put it on for Julien, and it immediately caught his attention. Right away, I added “Point of View” to the list of songs I could use to sooth Julien whenever something in the real world annoyed him to the point of him having a meltdown. Then, one night, since I knew nothing about DB Boulevard, I looked them up and found out, to my surprise, that they were a pop band that was formed in Padua, Italy. Yes, Padua–just like my last name. I don’t come upon the name Padua very often. I only have a handful of relatives here in the United States, with the majority of those who share the last name of Padua with me being in the Philippines, where the name is fairly common. It’s certainly a different situation from Heather’s–having the rather common surname of Davis, running into another Davis isn’t something she would consider all that worthy of note. For me, on the other hand, it’s always a surprise when I come upon the name Padua during the course of a day. I remember one time when we were kids, my brother Tony and I looked through the DC phone book and found one other Padua listed—a certain gentleman by the name of Napoleon Padua. He wasn’t anyone we knew, much less were related to. Still, Napoleon Padua was, to us, a sign that there could be more of us out there–a sign which, if we ever got close enough, could also be totally wrong. As it was, what I came across the name Padua it almost never had anything to do with the Philippines, the country my mother and father left in the early 1950s, but rather with Padua, the city in Italy. For me, that had to do. But even then, it doesn’t happen that often, and prior to finding out that DB Boulevard came from Padua, Italy, I discovered that about twenty miles south of our home here in Front Royal, there’s a small stretch of road in Sperryville, Virginia that goes by the name of Padua Lane. And before that, the last time I came across the name in the course of a day—other than the occasional crossing of paths with a reference to Saint Anthony of Padua—was almost twenty-five years ago at the Horseshoe Bar (aka Vazac’s) on Tompkin’s Square Park in Manhattan. I was there with my friend Michael Randall, a few years before I moved to New York, and at some point in the evening we ended up talking with a young woman who was standing near us at the bar. She had some kind of accent and way of gazing about her which showed that she was a person in transit. Soon, we found out that she was working for the time being as an aupair uptown, that her name was Vanna, and that she was from Italy—Padua, Italy. About a month later, when I was back in DC, I got a call from Vanna saying she was in town. I met her downtown and had lunch with her, then showed her around. I took her to the East Wing of the National Gallery, then moved on to the West Building before making our way to the Museum of Natural History. It was an enjoyable day, although there was no great connection—and that’s what I was looking for, here, some connection whether it was romantic or not. Some strong, or perhaps even profound connection with that name, Padua. Because even though it’s my family name, there was always something about it that name that just made me feel lost. Because to me it was a name that seemed to exist in some kind of limbo. It wasn’t an American name, so it didn’t make me feel more connected to the country where I was born and grew up. What’s more, to me it didn’t sound like a Filipino name either, so it didn’t seem to connect me with the Philippines, the country where my parents came from but which I’d never visited. Still, it was my name, and the name of a small number of us living in Washington, DC. But the thing was, I wanted to feel it was mine—feel that in that name, that word, was a key to my identity. And the thing was, I didn’t really feel that way, and never had. Vanna didn’t know how much longer she’d be able to stay in the U.S. Her father had been sick, she said, and she thought that at the very latest she’d be going back by the end of summer–to Padua, Italy. And I remember how she looked down, and–in some sort of sad but still hopeful Dorothy from the Wizard of Oz moment–seemed to imagine that she was already there. Back in her version of Kansas. At the end of the evening, Vanna had me take a picture of her with her camera. We were somewhere on Pennsylvania Avenue downtown, and she stood with her back to the street as the lights from the cars and buses flashed behind her; suddenly, she raised her right arm in a gesture of triumph, then smiled as she looked up to the nighttime sky. I pressed the button on the camera, the flash went on, and I heard the shutter open and close. That was the last time I ever saw her. And so the years went on, with my name in some existential limbo—a limbo that was of my own making, I suppose. A limbo that was the result of the many things I didn’t and, perhaps, could never know. As for my father, he lived on. Although my mother did not, and it was ultimately her illness that brought me back to DC after I’d moved up to New York, a city that had come to feel more like a real home to me than DC, the city where I grew up. After my mother died, I toyed with the idea of going back to New York, but I never did. 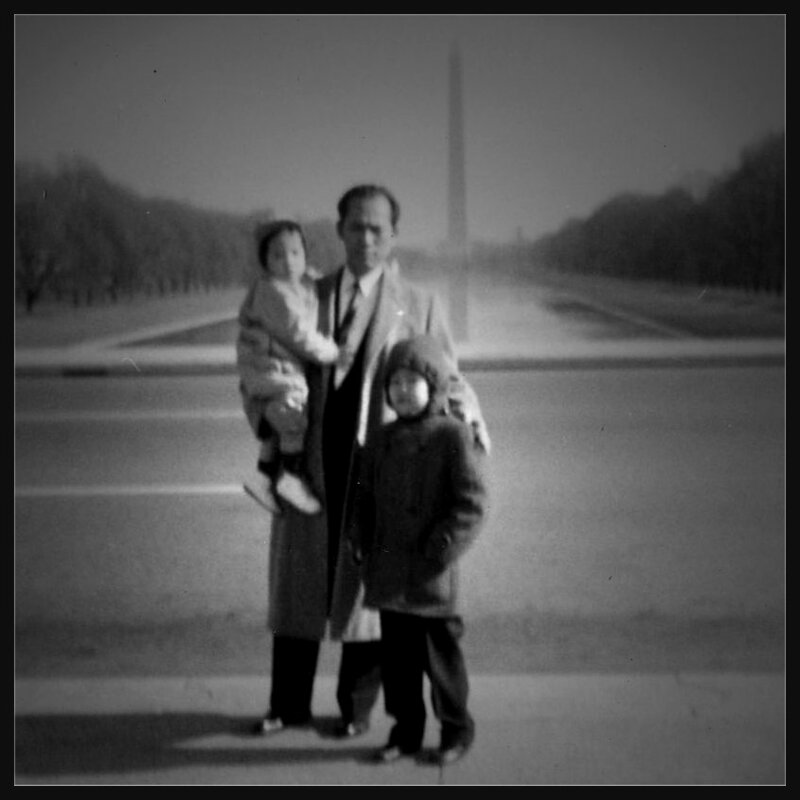 With my father and brothers there, DC, much more than before I left for New York, felt like the place I needed to be. And it was after that trip to State College, and after my father had survived having a good portion of his intestines removed as well a diagnosis of cancer—for which he declined chemotherapy and subsequently went on to live another ten years—I ended up with a steady job at the office where Heather had been working for a couple of years. Then one morning in early November, while I was sitting at a computer with another person on the staff going over some spreadsheets, Heather peeked in and asked if I wanted to slip out and get lunch in a little bit. It was at lunch that I learned about that taste you sometimes get in your mouth. Heather had been getting it these last couple of days–that distinctly metallic taste women often get when they’re pregnant. And just that morning, Heather had taken a pregnancy test–and she had looked at it closely to make sure she was seeing it correctly–and the test read positive. Which meant we were about to become parents. And it was sometime around when Margarita Mei Padua, my daughter, was born, that the feeling I had about the name “Padua” being in some kind of limbo began to vanish. I don’t know if it was overnight–maybe it was—but the lack of connection with my own family name was gone. Margarita–named after my mother—and Padua, the name my father brought here with him from the Philippines. And then when my son, Julien Tuazon was born–with Tuazon, being my father’s middle name—that limbo I lived with for so long now seemed far in the past. And it was somewhere around then that I remembered how, when I was young, I was astounded by how little I knew about life. And by the feeling I had deep in my bones that there was still so much more I wanted to know. It’s a feeling I hope I always have.